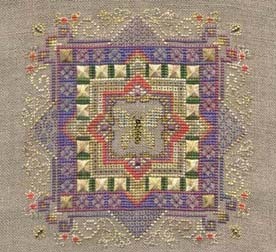 German embroidery and cross stitch designer, Martina Weber, introduced her first Mystery Project this past summer. The project is basically an "online class," but the mystery factor adds an extra special and suspenseful element of fun to the project. The current class is due to be completed on Dec. 31, 2001. For each Mystery Project, participants pay a price for the online chart, depending on size and duration of the class. Each stitcher receives parts of the chart at specific intervals. These can be downloaded from Martina's secure server with a special password. Charts can then readily be printed out, though, for the first project, some chose to stitch directly from the screen as it could be enlarged ad infinitum. Martina elaborates, "There are about 12 or 15 different fabric colors used by the members, from white over rose, purple to black and, as I left some choices of threads for some parts, there are different views too." 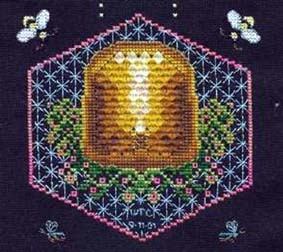 Martina provides detailed special stitch diagrams and written instructions. She adds, "All questions and input are handled in a Yahoo group - which is very nice, as I can stay in touch with the members and answer questions immediately, more or less." The participants can also share pictures and scans of the partially finished projects with Martina and each other at "secret" place, that only members have access to. 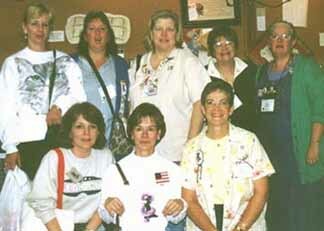 Some of the Mystery I participants attended the CATS Lancaster, PA show, held from Sept. 27-29, 2001, where they met face-to-face for the first time. just for them, Martina had designed a "button" featuring her logo-lady overlaid by a question mark, which they stitched up to wear to the show in order to identify themselves to each other. The Final Result, However, Still Remains a MYSTERY! Mystery II is scheduled to begin on New Years Day 2002. Martina says, "The new Mystery is a largish piece which will keep me and my members occupied for an entire year. 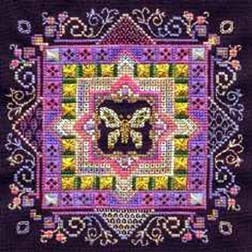 It will give a very rich embroidered look when finished The design will be cross stitch with some special stitches, which will be well explained on extra diagrams provided and by online help of me and other stitchers - you won't be alone!" The chart will consist of 12 parts. You can join the group and take part at any time during the year, but later subscribers will miss out on some of the "mystery" fun, since they will get all the previous published parts together and then take part in the monthly unveiling of a bit more of the "mystery" thereafter. The chart of Mystery II will not be published or made available to shops until the entire Mystery project has been completed. But it will not be nearly as much fun as doing it online with Martina and other group members when it is unveiled a bit at a time. 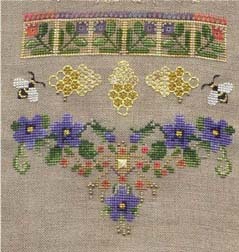 Since being the featured designer on the Caron Collection website, Martina has ventured into several other stitching techniques - among them filament silk embroidery inspired by the beautiful work of Helen Stevens. She continues to revel in the joy "of combining whatever I like in styles and threads." Martina adds, "Of course mostly silks, I cannot resist!" Currently Martina works as a freelance designer for a German thread company that sells her designs, stitched with their floss, to magazines like Anna and Lena. Previous to this, she worked for a Belgian needlework company that makes kits. In 2002, a new magazine published by the Burda publishing house will make its debut and Martina has been given the enviable honor of creating approximately 70% of the patterns to be featured in its pages. "And ­ drum roll!" she states, " I will be featured there in a two or more pages special - with photo of mine. I'm frantically searching for a good hairdresser!" All facets of Martina's designing business have expanded so much that she barely has the time to, as she puts it, "work something 'just for me.' Free time is hard to find, as family and business want to be squished into one pot. My garden is my rescue, as you get back to earth literally when weeding and poking grass out of muddy flowerbeds. As a rose lover I invested in several bushes of Old English Roses and they will for sure be the source of future designs, once they bloom." Martina avows that it is truly her stash of Caron threads kept in a drawer of her chest which keeps her inspired each time anew, "As when I am out of 'ideas,' I simply put some skeins on my desk here, and add a bit of beads and stuff, some other threads, some metallics, a few buttons and sew-on's and suddenly there is a new idea." This was exactly the way her new Mystery II project evolved -- the idea for it came to her while just playing with her collection of Caron fibers. 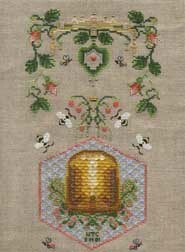 Scheduled for publication in 2002 is Martina's EX-Mystery I project, as a chart, entitled "Enchanted Gardens: Summer Afternoon." January 1, 2002 heralds the kick-off for Martina's new Mystery II project. Get in on this special online class and join in the fun and suspense as the mystery design unfolds bit by bit each month. For more details on Mystery II, see Martina's special Designer Peak this month!